Collaborative divorce is an alternative method for couples facing divorce. Through the collaborative process, spouses pledge to resolve all issues without court intervention. In a collaborative divorce, spouses focus on settlement with the goal to minimize the negative economic, social, and emotional consequences that families face in the traditional adversarial divorce process. In a traditional divorce, the process to reach a settlement agreement is done so through the lens of the adversarial process, with spouses postured as opponents and case strategy developed to prepare for trial. As such, even when a case settles without a trial, both spouses walk away feeling disappointed, frustrated, and exhausted, regardless of the outcome. Fundamentally, a collaborative divorce differs in the approach couples take to dissolve their marriage. These differences include the framework for approaching the divorce process, the timeframe/length of the process, the expenses involved, and outcomes/solutions for families. Collaborative Divorce: You and your spouse are committed to resolving your divorce with mutual respect, integrity and transparency. The process is client-centered and focuses on children’s best interest. Conflict is managed and handled respectfully and with the assistance of mental health experts, if needed. Collaborative Divorce: You and your spouse set the timeframe for moving through and completing the divorce process. Litigated Divorce: You and your spouse are at the mercy of a crowded court calendar to determine the length of the process. Collaborative Divorce: Collaborative divorces are less expensive than a fully litigated divorce, even with the use of a team of experts (attorneys, mental health professionals, and financial experts). Litigated Divorce: The costs of a litigated divorce are unpredictable. Each stage in a litigated divorce (initial pleadings, temporary issues, discovery, settlement negotiations, trial preparation, and trial) can cost thousands. 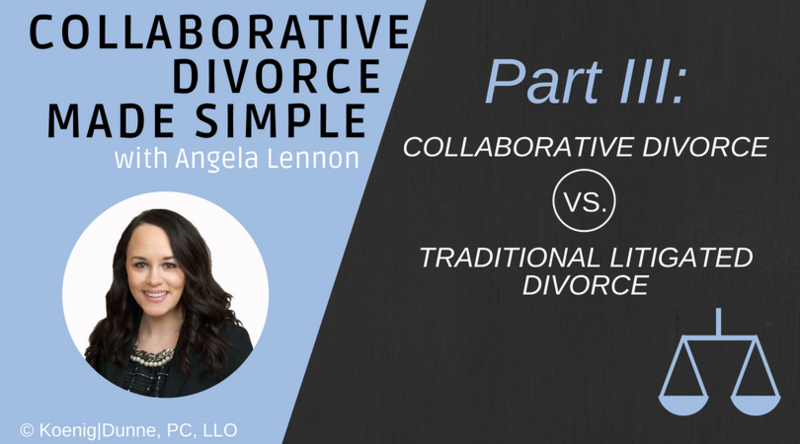 Collaborative Divorce: You and your spouse craft creative solutions (with the help of your attorneys) to meet the unique needs and interests of your family. Litigated Divorce: The Court rules on the issues (after usually 1 day of trial) that you and your spouse are bound to abide by. Angela Lennon is a certified collaborative lawyer and a member of the Nebraska Academy of Collaborative Professionals. If you or your spouse is considering a divorce, contact our office to schedule a consultation (or call 402-346-1132) to learn more about collaborative divorce and to find out if a collaborative divorce is right for you.